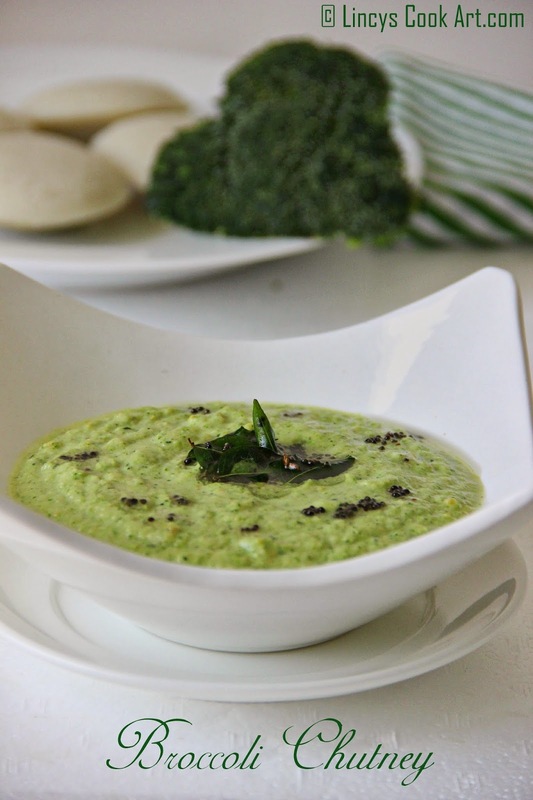 Broccoli chutney is an easy to make healthy chutney can be made with green chillies or dried red chillies. Some people like the roasted, dried red chilli flavour in chutney. Those who like red chilli can use dried red chili by roasting the chilli with dhal. I did not inform my family members that this chutney was broccoli chutney and they did not find much difference of taste. This can be used as a dip or spread for sandwiches also. Easy way to incorporate broccoli in our diet. Tasty and also healthy chutney/ side dish for Idli and Dosa. In a pan add half a teaspoon of oil and roast the channa dhal and urad dhal. In another pan heat a teaspoon of oil and saute the broccoli. Add salt, cook till it's done and allow to cool. In the mixer jar add the coconut, garlic then add the roasted channa dhal, urad dhal, salt and broccoli. Grind this as a fine paste. Add half a cup of water and grind again till you get the chutney consistency. Heat oil in a pan and add mustard seeds. When it splutters add the curry leaves and switch off the gas. Add the tempering to the chutney and mix well. If you feel the chutney is too thick add some water and dilute it. Check the salt and add if required. Note: People those who use ginger instead of garlic can replace garlic with ginger. Green chilli can be replaced with dried red chilli and added at the time of roasting the dhal. A small piece of tamarind also can be added at the time of roasting dhal. Healthy n yummy chutney.interesting recipe. Healthy and tasty chutney !! Thats an incredible chutney, mine is bit different from urs.